It’s difficult to find good yarn in Turkey. This might surprise a lot of knitters, especially when it’s so commonplace to see “Made in Turkey” printed on ball-bands, but it’s true. It’s a recent innovation – no doubt fuelled by the demands of the new generation of knitters – to have yarns that are 100% wool, and 4ply has only been available for a season or two. I’ve been able to find some sock yarn, imported from Germany and available in uninspiring muted hues, or garish leftover colourways, but nothing that would sate most knitters these days. You can’t imagine the envy I feel at seeing all the delicious hand-dyed yarns that appear in my Ravelry friend stream every day. You might think that Turkey (especially Ankara) would be rich in angora, being famous for its angora goats, but even that comes plied with acrylic, or polyamide, or nylon. I was amused when I found this ball of “vintage” Nako yarn when we were moving a few months ago. Mum thinks it’s left over from a slipover she knit in the 70s. 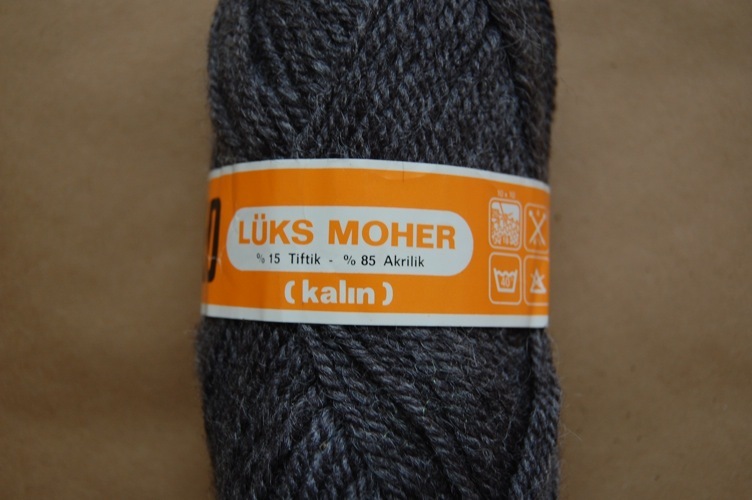 The label says “Lüks Moher” (Luxury Mohair), which is funny because, as you can see, the yarn is 15% angora & 85% acrylic. “Tiftik”, from what I can gather, is technically the term for angora mohair, but can also be used to denote any fuzzy wool; “kalın” means “thick”. 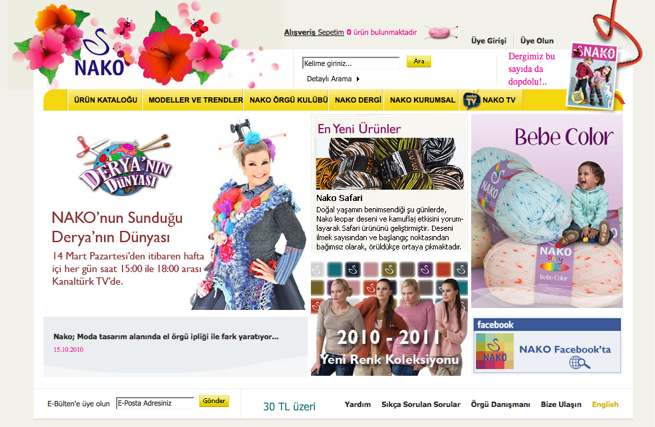 Nako is probably the largest yarn manufacturer in Turkey, and you will be comforted to learn that it is still keeping up this tradition of misleading yarn naming; they currently have a yarn called “Süper Angora”, which is made up of 35% Mohair & 65% Acrylic, while their regular “Angora” is 50% mohair & 50% acrylic. Even worse, their so-called “Ankara Tiftik” has only 20% mohair. I have to say, I still like Nako yarns though. 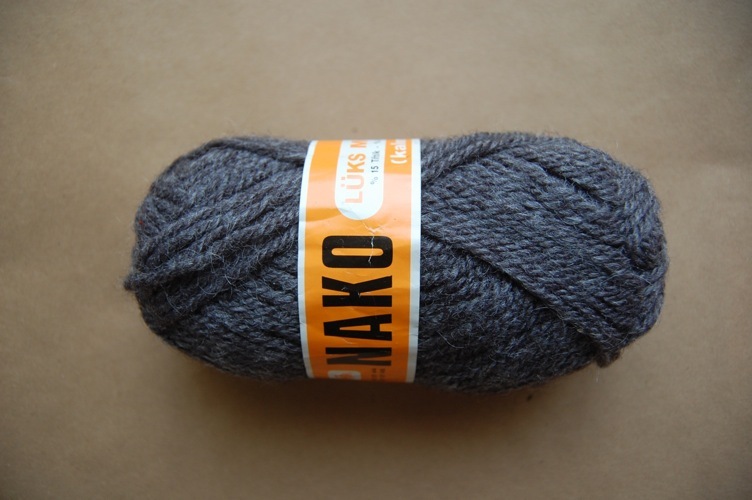 For all their inconsistency, their 50% wool, 50% acrylic “Nakolen” is my go-to yarn (last time I used it for my Parasol Stole), because it feels nice, doesn’t pill, and comes in a wide range of colours. It’s common in Turkish to spell out foreign words phonetically, so I’m assuming the “-len” here is a transliteration of “laine”, again, not entirely accurate. Their “Merino”, though, you will be glad to hear, is in fact 100% merino (I used it for my pink hottie cover). And not to be too harsh on Nako, even our beloved Rowan isn’t above wily naming tricks. Their “Cashsoft” collection is a little short on “cashmere”, and high on “cash” for my liking. Note: This post is part of Knitting & Crochet Blog Week 2011. 28th March, 2011 // Yarn // tags: 2KCBWDAY1, ankara, blog week, turkey, turkish yarn. I only managed to get to one yarn shop in Turkey last year on my holiday – it was a bit cheap and cheerful, if you know what I mean – but I did get some incredibly cheap good quality cotton. It does surprise me that it is hard to get good quality yarns there because of the spinning thing, but I suppose it’s all for export. Sorry, just getting around to replying to KCBW comments. that’s so interesting! Especially considering the rich heritage of Turkish knitting. I only lived there for two years, and found the rate of change in Turkey to be really fast, you could actually see progress from one year to the next (at least an outsider’s perspective) Considering that it is increasingly a fashion destination, I wouldn’t be surprised if unblended merino starts to appear soon. So a big hello to you Laylock! I have been browsing all over the internet to find someone who might be able to translate Turkish Patterns using Nako wool.Any suggestions? I live in India and we have started importing Nako wool here. I have tried Google and Bing translate and it make no sense!! HELP!! Hi Carol. I’m afraid I couldn’t translate Nako patterns without their express permission to do so, however, I do have a few patterns that use Nako yarns. In addition, I could compile a glossary of Turkish knitting terms, if that would be helpful to you. Hi! I have a pattern that I believe is in Turkish. Might you be able translate it into English for me? Thanks so much. Very interesting post! I’ve heard of many yarns from Turkey, I always assumed there was a big selection available there! And how interesting that they have yarns called Angora, that don’t have any angora in them! Isn’t it strange? I wouldn’t have guessed it either. It’s certainly a bit sad that a manufacturing country doesn’t make full use of its own products! Funny! In America we have yarn called “Vanna’s Choice” and label looks very similar to your Derya’s Choice. The quote is also the same.